Pune: ‘‘PM Smriti Irani when? Never! I came into politics because I got to work under a charismatic leadership. I was lucky to work under the leadership of Atal Bihari Vajpayee before and now serving under the leadership of Narendra Modi. The day Narendra Modi will decide that he will hang his boots will be the day I will also leave politics.’’Said Smriti Irani, Union Minister for Textiles. She was speaking at the event ‘Words Count’ – a festival of words that has been hosted in Pune by Varsha Chordia and Sabina Sanghavi, renowned connoisseurs of literature and acknowledged aficionados of art and culture. Smriti was interviewed by the curator of the festival and noted columnist Advaita Kala. Entrepreneurs Atul Chordia, Sagar Chordia were present on the occasion among the dignitaries. The event took place at JW Marriot, Senapati Bapat Road. Continuing the point, Smriti also said that ‘I will leave the office doesn’t mean that I will leave the family’ . 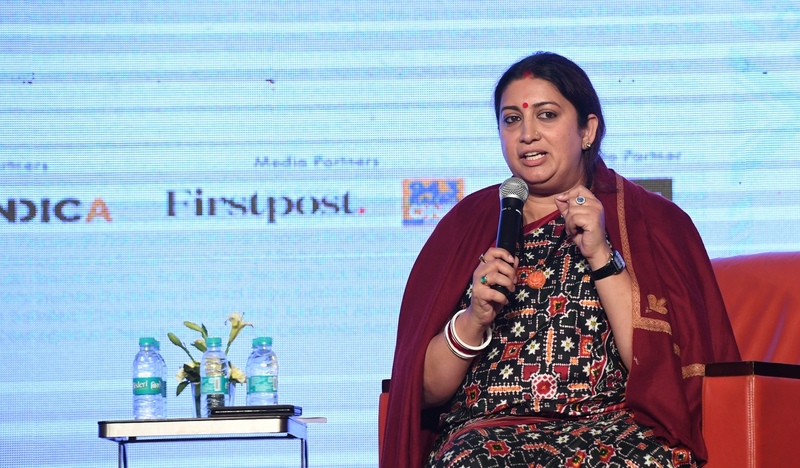 Talking about whom she admires from women politicians, Smriti said that, today there is explosion of media and presence of social media. But when Sushama Swaraj and Sumitra Mahajan began their journey, the condition was comparatively tougher than today. They made difference in the Indian politics without any additional support and thus I look upto them as the source of inspiration. After being asked that suddenly the most important election state of Uttar Pradesh, Women politicians are being talked about more. She said, It is good to see that women politicians are taking centre stage. Whether alliance of SP- BSP will work in UP her answer was the cycle gets punctured if the elephant sits on it.